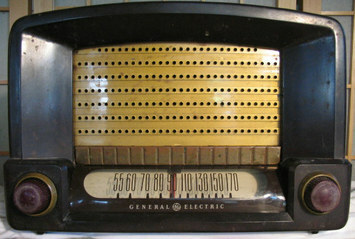 The first radio I ever recapped. Chosen for that distinction because of its very simple and uncrowded layout. Indeed GE marketed this radio as a budget model and, though its performance is decent, the audio is unusually tinny for a set of its size. There is no dial lamp, another sacrifice to the set's low sticker price no doubt.